In the spirit of yearly summaries and assembling popular posts, I offer you my personal agility sketch favorites for the future of work. However, before the future of work sketches unfold, let’s review the statement, drawing is thinking. At least that is what Milton Glaser, gifted designer, wrote in his last book. In his 90th year, and known for his iconic images like the I ❤️ New York Logo and the psychedelic Bob Dylan poster, he continues to think, draw, and create. Adopting this idea, I created multiple doodles per week to clarify my thinking and placed them on Instagram at AgilityThink. Yes, it’s true. Drawing is surely thinking. It is also a way to honor my inner artist. A way to observe the workplace, human behavior, highlighting important agility trends. My favorite ride in Walt Disney World is Toy Story Mania, an interactive 4-D ride that heightens my adrenaline as much as any roller coaster. 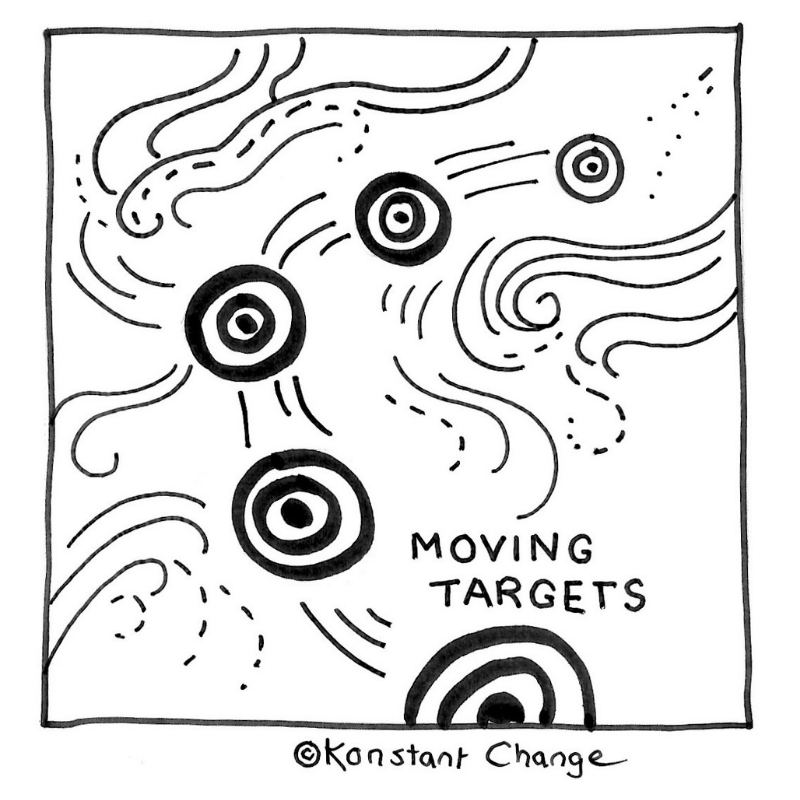 The goal is to blast moving targets in a midway (carnival) style shooting game. There is a sense of accomplishment achieved when anticipating movement of objects on the screen. By responding to the moving objects and positive feedback, I win! Much like an agile project and focus on agility, the quick wins sharpen my skills and give me confidence for the next round. Fast-moving targets and uncertainty is certainly taxing for employers and employees alike. But being successful in the future of work relies on nimble and swift responses to change. This is necessary on the part of individuals and organizations. Looking to the future of work takes imagination. People who focus on innovation. 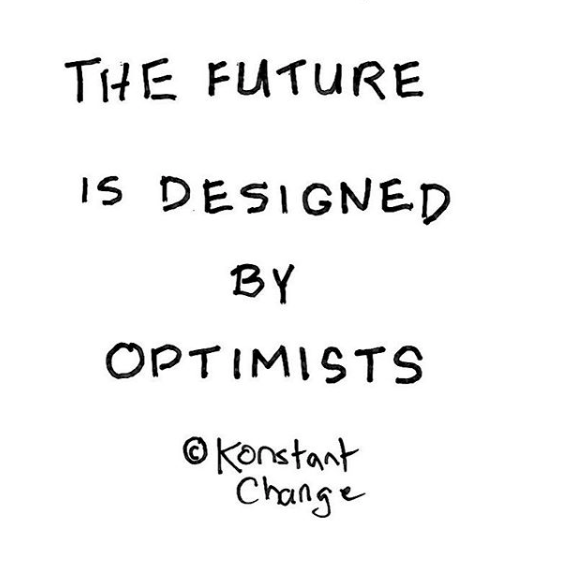 Whether guided by disruption or incremental innovation, the future of possibility starts with inquiry. Small questions and big questions from the curious and the interested. Future-proofing your work can be accomplished through cultivation of hobbies. Hobbies engage and attract you with the promise of expanding your curious brain. When you become a victim of ritual, you stop learning. A hobby, especially one unrelated to your line of work, will shine a light on new ways of thinking or solving problems. . Exploring new areas of interest outside your main profession opens up neural pathways in brain development. 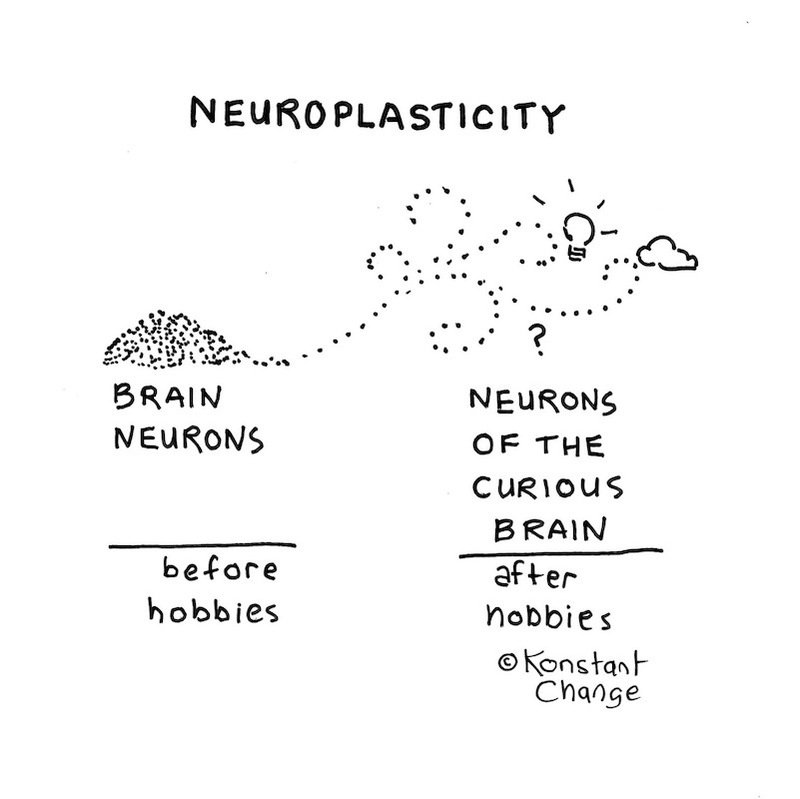 Neuroscience researchers discovered the concept of neuroplasticity in the 1960s (G. Raisman 1969). It was shown neurons could evolve from childhood to adulthood, creating new opportunities to learn. Which feels like the equivalent of a redo every single year of your life. Your behavior can modify your thinking! 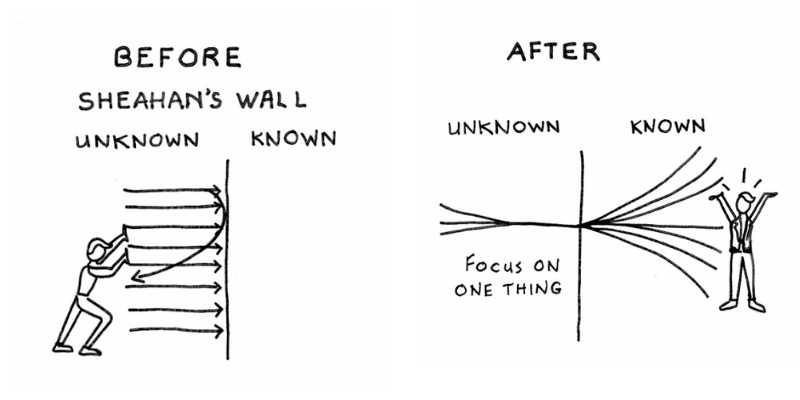 You get out of a rut of solving problems in familiar ways. You will come up with creative ideas, helping your team members in strategy sessions. Frameworks from one industry or profession may stimulate new product development in your area. What have you always wanted to do? Do it and call it a hobby! Future of work possibilities will expand as your curiosity expands. The future of work requires a curious and agile mindset. What you do know is far less that what you don’t know. Exploring areas in the unknown opens up unlimited possibilities for personal and professional growth. Due to low-cost or no-cost opportunities to learn, gaining a new skill is accessible to all. Youtube classes, Massive Online Open Courses (MOOCs), certificate training, upskilling at places like General Assembly and Udemy offer numerous chances to learn. What is it that you would like to learn? 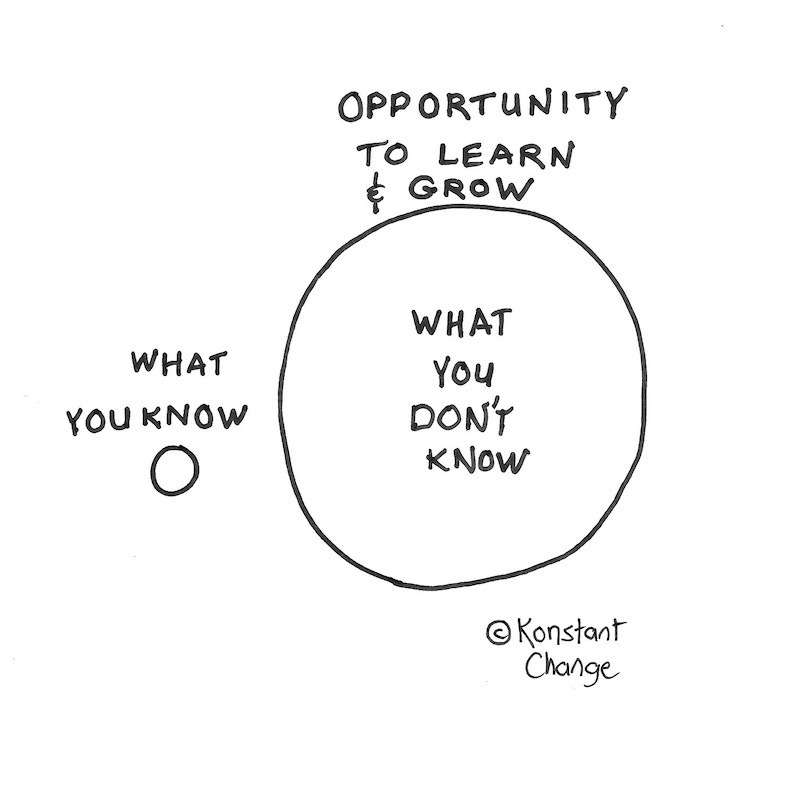 Make a dent by enlarging the circle of what you know! Your ability to become known for your distinctive traits and accomplishments will be critical for sustaining career relevance. The future of work depends on it. When you are broadly focused and not specific enough regarding your distinctive value, it is difficult to break through. Additionally, you will struggle to get noticed in the workplace or in your industry. It’s up to you to develop your personal brand to help people remember you. Rory Vaden, renowned personal branding expert, first introduced me to Sheahan’s Wall. Peter noticed people choose many different topics and tactics in an attempt to separate from the crowd, yet they cannot break through the wall. They boomerang back into a sea of noise. For individuals and entrepreneurs, the solution is to pick one thing you are really good at. Something that ignites your passion. Focus on that until you break through to the other side of recognition and trust. However, focusing all your efforts on one topic results in breaking through workplace and market clutter. To clarify, once you are the go-to person for one thing, you have established demand for your talents and services. People will remember you. You will eventually be able to broaden your contributions, topics, and services due to the power of your individual brand and reputation. And don’t forget to highlight the problem you solve with your unique brand. What do you want to become known for, and what problem does that solve? For example, my goal is to become known for agility and the problem I solve is stagnation. 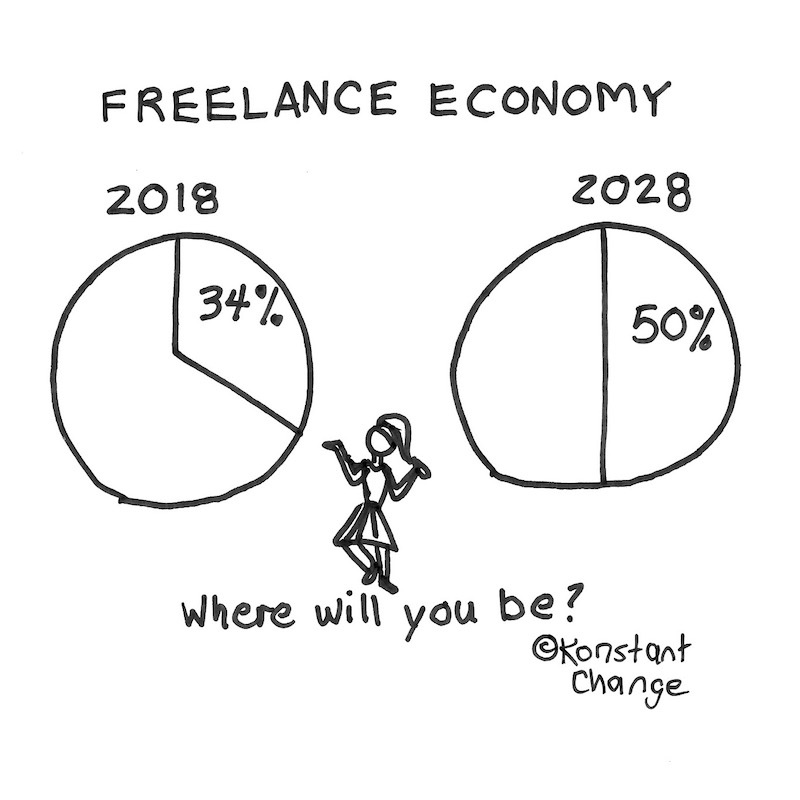 The fastest growing segment of workers is in the freelance economy. 34% of us now work as consultants, contractors, and freelancers. According to a study conducted by UpWork and the Freelancers Union, it is predicted to expand to 50% in 10 years. Consequently, corporations are hiring a leaner staff of workers, due to more efficient operations. The most important part of this story is businesses will require more contractors and freelancers to flex with the changing needs of the organization. For example, other reports state that freelancers are upskilling at a higher rate than corporate workers. What are you doing now to plan for 2028? Above all, I hope you enjoyed the best of 2018 sketches as you make tracks in 2019.